A Guide to Planning for Community Character adds a wealth of practical applications to the framework that Lane Kendig describes in his previous book, Community Character. The purpose of the earlier book is to give citizens and planners a systematic way of thinking about the attributes of their communities and a common language to use for planning and zoning in a consistent and reliable way. This follow-up volume addresses actual design in the three general classes of communities in Kendig's framework-urban, suburban, and rural. The author's practical approaches enable designers to create communities "with the character that citizens actually want." 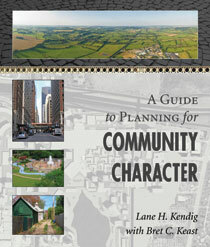 Kendig also provides a guide for incorporating community character into a comprehensive plan. In addition, this book shows how to use community character in planning and zoning as a way of making communities more sustainable. All examples in the volume are designed to meet real-world challenges. They show how to design a community so that the desired character is actually achieved in the built result. The book also provides useful tools for analyzing or measuring relevant design features. Together, the books provide a comprehensive treatment of community character, offering both a tested theory of planning based on visual and physical character and practical ways to plan and measure communities. The strength of this comprehensive approach is that it is ultimately less rigid and more adaptable than many recent "flexible" zoning codes. "A real-world perspective on how to think about community character—what it is, how its changed over time, and what a planner can do to make it better. The authors pull together a lifetime of work in an engaging and thoughtful book; they show us the numbers and help us learn from real places—a must for every planner's bookcase." "Lane Kendig is one of planning's most creative thinkers but always with a practical perspective. Here Kendig and colleague Bret Keast provide not only concepts but illustrations, formulas and matrices for achieving and maintaining the character of communities ranging from urban centers to auto-suburban areas to rural hamlets." Eric Damian Kelly, Professor of Urban Planning, Ball State University, author of "Community Planning"
"Kendig and Keast offer us a guide (not dogma) for understanding community character and for shaping the future form and function of our communities. They frame the elements of community in terms which are useful to the expert and informative to those who are ultimately responsible for resource planning and management—local government officials. This book is an important resource for the professional, but more importantly a guidebook for non-professionals who are the ultimate players in the 'Zoning Game.'" "These [with Community Character] are by far the most complete and detailed works dedicated to community character that I have ever come across. That makes these books a valuable addition to any planner's reference collection." Introduction: Why Should We Care about Community Character?